Anida Yoeu Ali's The Buddhist Bug, Into the Night 2015 extends from her 'Buddhist Bug' series of photographs, videos and live performances. 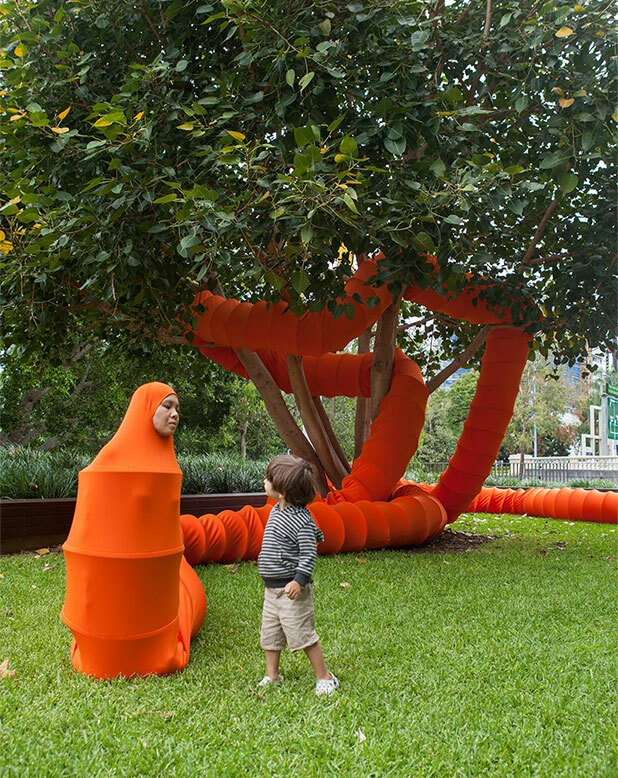 In these works, the artist playfully inhabits a sinuous, caterpillar-like costume whose colour references the robes of Buddhist monks. 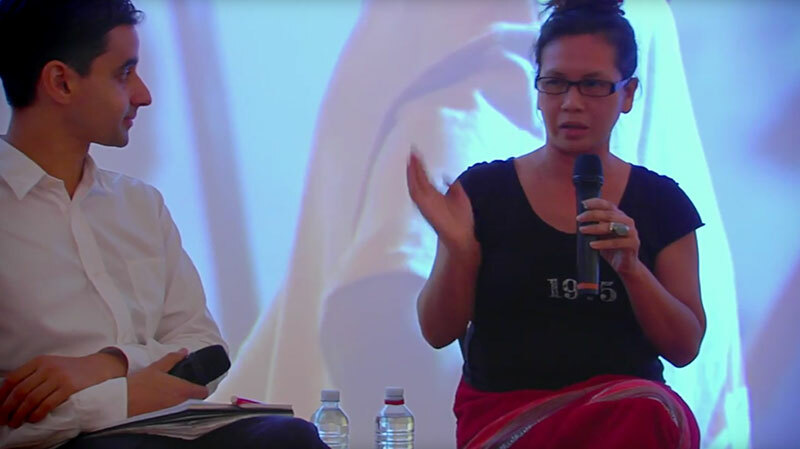 Ali's bug was inspired by her fascination with Buddhism as a Khmer-Muslim, and the exploration of diasporic identities. The project developed when Ali returned to her birthplace of Cambodia as a means of inhabiting and recording Cambodia's changing rural and metropolitan landscapes, and of negotiating her culturally mixed background as 'Khmer-Muslim, Cambodian-American, Cham minority and Malaysian'. 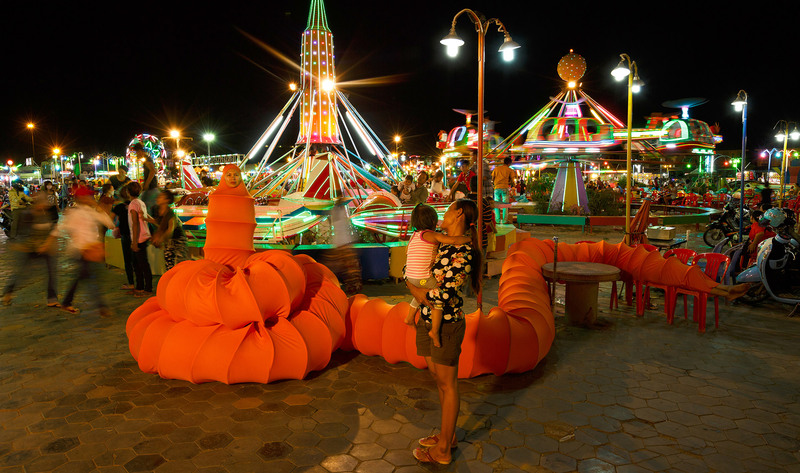 In a series of social encounters in locations around Phnom Penh, Ali's bug impassively occupies central stage among communities, schools, cinemas, restaurants, bars and urban and rural landscapes undergoing rapid change and development. Its lengthy coils wrap around tables, are poised with grace and improbability on a bicycle, and infiltrate karaoke bars. Her video for APT8 documents these engagements with Phnom Penh at night time, staging the nocturnal bug as a 'powerful place for encounter, habitation and reinvention'. 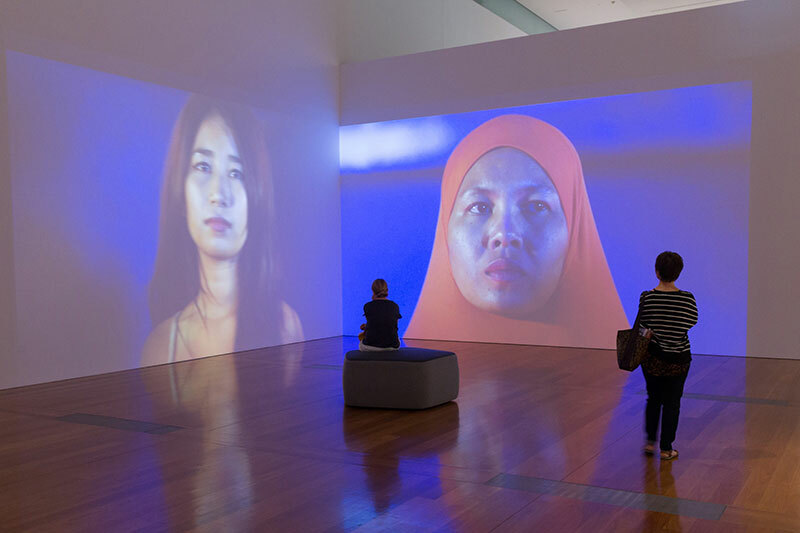 Anida Yoeu Ali's video work installed in APT8. Anida Yoeu Ali performing at the APT8 opening weekend. Anida Yoeu Ali discusses her work displayed in APT8.